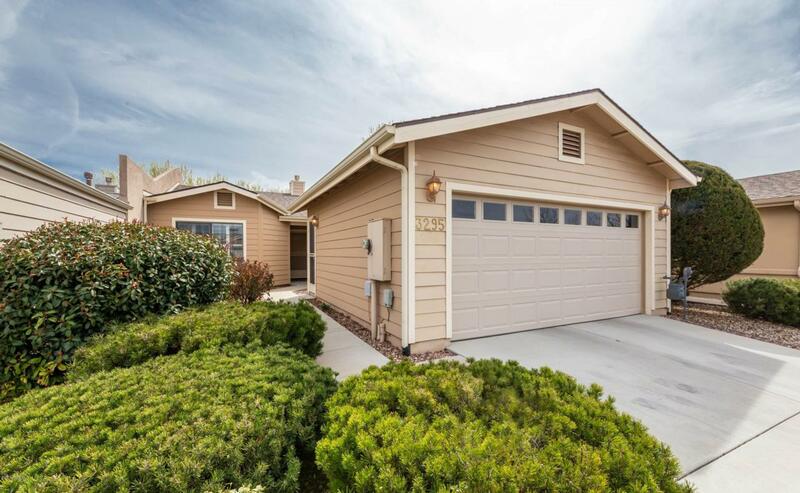 Prescott's premier over 55, gated community. Private roads, quiet neighborhood and great location. Close to shopping, medical, and dog park. Updated kitchen with new microwave, painted cabinets, new faucet, and counter tops. Open floor plan, vaulted ceilings, updated with engineered wood flooring in main living area, 2 Sky lights, and screened in patio. Both bathrooms are full baths. The back room backs up to the seasonal creek and levy behind the fully fenced easy maintenance yard. Garage cabinets and all appliances included. RV parking available at The Gardens. The Clubhouse is located just across Aster and has a Billiards room, Exercise room, Kitchen, library, spa and HEATED POOL. Low HOA for all the amenities provided. This one will go fast, so see it soon! Listing provided courtesy of Rhonda Johnston of Better Homes And Gardens Real Estate Bloomtree Realty.